You have such a great eye. I love it! Great window. I like the combination of panes and reflections. thanks for sharing this little bit of Germany. I love old world architecture. What a gorgeous picture! A magical WW to you! Wow! Great shot of the window. What a cool window. I just love that old architecture in Europe. Oh, that is lovely! Wow. I see another of from your "arch" collection. Beautiful. This is so interesting. I have a fascination with reflections. When I look out my office window I see a very old building reflected in and distorted by the windows of the very modern building across the street from mine. That's a great shot! You're a great photographer! What a neat shot. Love the reflection of the tree and the window. So how did you keep your own reflection out of the shot? You have lovely texture and lines in this shot. The hues in the bricks are very becoming. That is a beautiful photo, Beth. Gorgeous! You really captured the reflection and the window just perfectly. Bravo! Gorgeous! 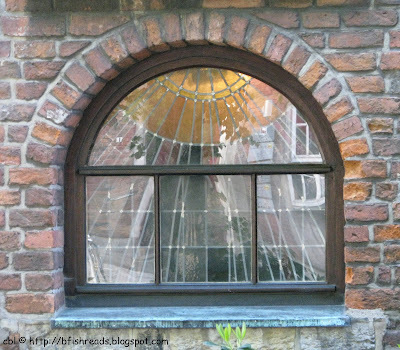 It's funny how the window looks broken at first glance and you have to study it to see that it's stained glass!